Uncategories K.Gaines, Ras Kass, Lyric Jones in the video for "Cook That Bass"
K.Gaines, Ras Kass, Lyric Jones in the video for "Cook That Bass"
Brooklyn emcee K.Gaines presents the music video for "Cook That Bass", the new single featuring Ras Kass and Lyric Jones from Ticket To Elsewhere, his collaboration EP with Los Angeles-based producer Maxwell Benson coming soon on Priority/Capitol Records. Phaze4K, Leo Coltrane and Sebastian Marciano are also set to appear on Ticket To Elsewhere, the first of five EPs K.Gaines plans to drop in 2018, each of which will be a collaboration with a producer from a different region of the US. "Cook That Bass" comes on the heels of the release of visuals for Ticket To Elsewhere's first single "Opulence" (watch). 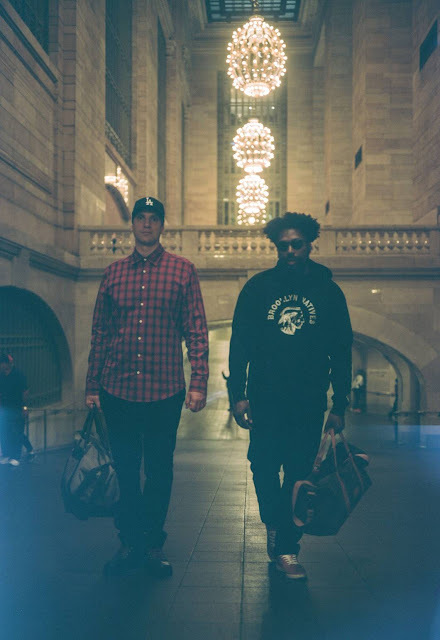 Maxwell Benson has worked with Too Short (stream "19,999"), Rapper Big Pooh and Sadat X (stream "Sadat X Is Back"), and gives Ticket To Elsewhere its West Coast focus. Gaines' last album was Rumspringa: The Wildman Chronicles(Spotify) and starred in the short film Kung Fu Bum (Youtube) which was showcased at several film festivals, as well as the newly released "Brothers" (Youtube). Los Angeles visual artist Reef Kills provided Ticket To Elsewhere'scover art. The artwork for each EP in the series, once juxtaposed with each other, will form a more intricate visual piece with all the purpose and intention of a map which can lead you to hidden prizes around the country.